Discover how Minnesota Diversified Industries (MDI) saves hundreds of hours with simplified reporting. Reporting is not a task that should be taken lightly. It’s needed to obtain actionable insights and help make decisions that can effect real change. But that can’t be done if you’re having employees spend endless hours each week manually collecting and analyzing data. So, what do you do when you’re being forced to spend countless hours running reports, hoping they’re done in time for the data to still be accurate? 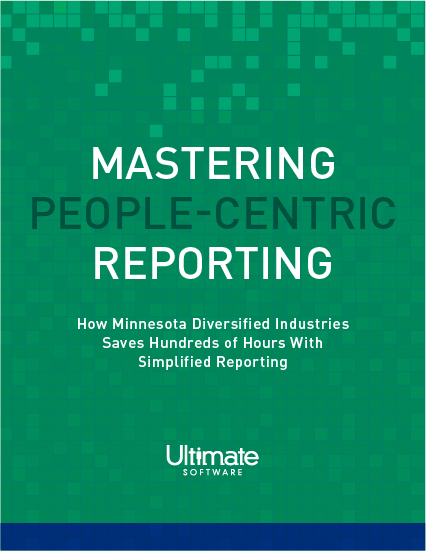 Mastering People-Centric Reporting looks at how non-profit organization, Minnesota Diversified Industries, uses UltiPro® Business Intelligence to complete reports quicker to help make improvements to their organization as needed, and stay compliant with government contracts. Hear from their CFO to see what UltiPro has done for them, and what it can do for your organization. Please fill out this brief form to see how MDI is mastering people-centric reporting.